SANAA, Yemen (AP) — Yemen’s warring sides were divided Thursday over a U.S. Senate vote to end America’s support for the Saudi-led war in the impoverished country, with the Yemeni government condemning it and the Iran-backed rebels welcoming the development. Information Minister Moammar al-Iryani denounced the vote, saying it would only “embolden Iran and empower its proxy,” the rebels known as Houthis. The Senate vote on Wednesday brought the Congress one step closer to an unprecedented rebuke of President Donald Trump’s foreign policy. It also put Congress on a collision course with Trump, who has already threatened to veto the resolution. “In reality, America is the one … selling weapons, and providing support” to the coalition, top Houthi negotiator and spokesman Mohammed Abdel-Salam told The Associated Press. In this way, the U.S. only “prolongs the conflict and the humanitarian crisis,” he said. Yemen’s conflict erupted in 2014, when the Houthis seized the capital, Sanaa, forcing the internationally recognized government to flee abroad. A Saudi-led coalition of Arab states intervened the following year, waging a destructive air campaign in support of the government. 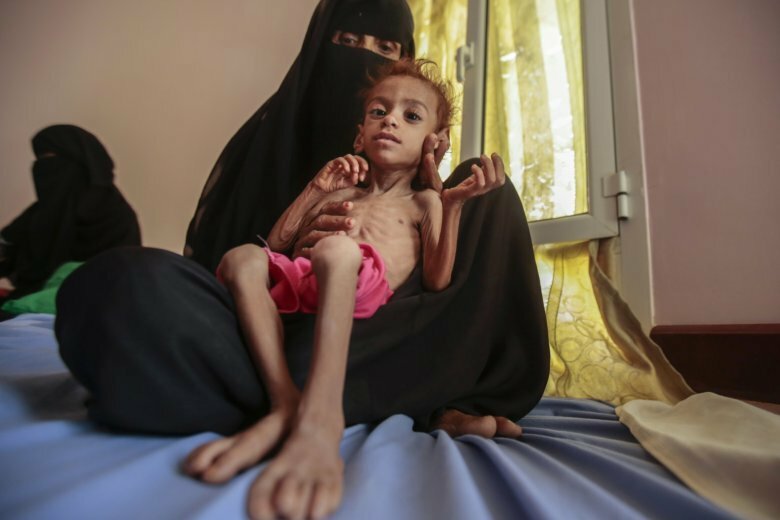 Thousands have been killed and millions pushed to the brink of starvation. The West, including the U.S., has provided the coalition with billions of dollars in arms, in addition to logistical support. In addition to arms, U.S. military experts have acted as advisers to the Saudi and Emirati command centers in Riyadh and elsewhere, and a U.S. pullout could also impact intelligence gathering. As Saudi-led coalition airstrikes claimed thousands of lives over the years, mostly in northern Yemen where the Houthis are based, the U.S. insisted it plays no role in targeting Yemenis. The development in the Senate came on the same day that U.N. envoy for Yemen, Martin Griffiths, reported no progress to the Security Council in getting Yemen’s warring parties to withdraw their forces from the key port of Hodeida and two smaller ports as called for in an agreement they signed in December. The agreement was meant to ensure smooth passage of aid through Hodeida, a strategic gateway for relief, into Yemen. “Twice we’ve seen these clear expressions of the will of Congress push forward the peace process in very concrete ways,” said Layla E. Picard. She said U.S. involvement in Yemen would be more positive if it was focused on diplomatic efforts to reach a peaceful end to the war. Al-Iryani, the information minister, warned that any U.S. pullout from its support for the coalition in Yemen’s war would only serve Iran. Trump’s support for Saudi Arabia came under the spotlight after the brutal killing of U.S.-based Saudi journalist Jamal Khashoggi last year. Lawmakers from both parties have criticized Trump for not condemning Saudi Arabia strongly enough for the killing. Khashoggi was killed and dismembered inside the Saudi Consulate in Istanbul, his remains have not been found. In addition to supporting the Saudi-led coalition, the U.S. has also been fighting al-Qaida in Yemen, mainly through drone warfare. It wasn’t immediately clear how a U.S. cutting of ties with the coalition could impact that campaign.